Charlie Willis submitted these photos and caption. I had two daughters that were members of DCI corps this past summer; one with the Boston Crusaders and the other with Pioneer. I took the first three photos at the June 22 show in Dublin, Ohio. The first is is of my daughter Cindy getting the finishing touches put on her uniform before Pioneer's performance. The second is my daughter Katrina during Boston Crusaders' warm up before the show. 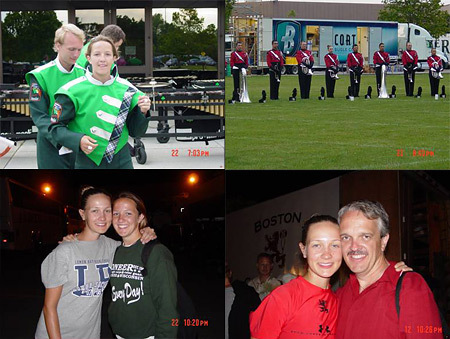 The third is a photo of my daughters together after their performances, and the last is of me with Katrina after the DCI event in Orlando. As you can see I am a proud dad of both girls!